This article is about the vine-like plants. For the Brothers Bear with the same name, see Bramble (character). Not to be confused with Bramball. Brambles are a spiked vine-like plant primarily found in the Donkey Kong franchise. 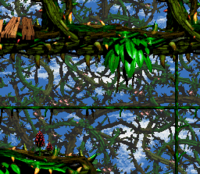 The first appearance of Brambles is in the game, Donkey Kong Country 2: Diddy's Kong Quest. 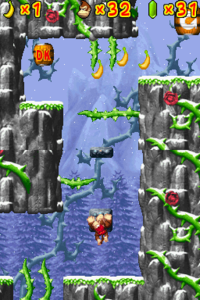 Here, they are an obstacle featured prominently in several levels and also in several bonus stages. The theme for bramble-based levels is referred to as "Stickerbush Symphony" by the official soundtrack and "Stickerbush Symphony" by the Game Boy Advance remake. A remixed version called "Bramble Blast" is available as a CD in Super Smash Bros. Brawl. They later appear in the Game Boy counterpart to Donkey Kong Country 2: Diddy's Kong Quest, Donkey Kong Land 2. Brambles return in Donkey Kong 64. Here, it is found in only one area, Fungi Forest at night. In this game Donkey Kong must use a Strong Kong Barrel to transform into his Strong Kong mode to cross a large patch of bramble which conceals a Kong Switch which must be pressed to open a nearby locked barn door. In Donkey Kong Country Returns and Donkey Kong Country Returns 3D, Brambles reappear in the level Crazy Cart. In Donkey Kong Country: Tropical Freeze, they appear in the level Bramble Scramble. Brambles in DK: Jungle Climber. Brambles appear in DK: Jungle Climber, where they no longer make giant mazes, but still wildly grow in levels. Some also would constantly grow shorter and longer. Brambles growing from the Big Windmill in Super Mario Sunshine. 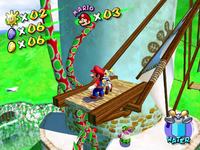 Brambles make their first appearance outside a Donkey Kong game in Super Mario Sunshine, where a few large vines can be found surrounding the Big Windmill in Bianco Hills whenever Petey Piranha is on top of it. These brambles are red with green spots, which twitch slightly. They disappear after Petey's first defeat. In Super Mario Galaxy, a few giant brambles appear in the Gusty Garden Galaxy. Several of them grow on a ring-like planet with Pull Stars in the middle. Going to this planet is only optional, as a Launch Star is meant to shoot Mario through the ring, and only a well-timed catch from a Pull Star can get Mario into the planet. This type of bramble also appear in the same galaxy on the last planet before the battle with Major Burrows in the third mission. Mario approaching some Brambles in New Super Mario Bros. Wii. Brambles make their third appearance in a Mario game in New Super Mario Bros. Wii in World 5, where they act as obstacles to impede Mario's progress. After Iggy Koopa, the world boss, is defeated the bramble vines will disappear. Also, a type of bramble enemy called Bramball appears in this game. In Mario & Luigi: Bowser's Inside Story, brambles appear in one section of Dimble Woods where Luigi must travel in the withered Giant Sockop across a patch of them to reach a group of normal Sockops, one of which has Mario, and another, an Attack Piece Block. After the Sockops are defeated, the Brambles must be crossed via narrow twisting platforms. Brambles reappear in Mario & Luigi: Dream Team. They appear in Somnom Woods, and can be Side Drilled through. If Mario or Luigi touch them, they act like a wall. When they are passed through, they slightly expand. Brambles make a minor appearance in Mario Party 9 in Toad Road. Multiple Brambles appear in Mario Party 10 mainly in Mushroom Park, where they can be seen behind the Tower and Fortress. Bramble-like vines appear as the stalks for many Piranha Plants, such as Naval Piranha, Spiny Piranha Plants, Prickly Piranha Plants, and Piranha Creepers.